Matt is a guitarist, composer, and music educator in the twin cities area. Studying under various instructors, he has studied genres such as Rock, Funk, Blues, Jazz, Metal, Pop, and Classical music. 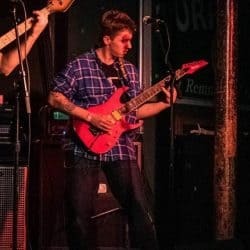 He has been performing regularly in the Twin Cities since the age of 14 and is currently finishing his AFA Guitar performance degree at ARCC. Matt has been teaching the styles listed above, along with music theory, ear training, and improvisation for 4 years. He has been working with students between the ages of 5 and 65, and is comfortable with all ages and skill levels. He loves to share the joy of music with students. Learning music can teach you discipline, confidence, responsibility, a sense of belonging, and many other valuable life skills. Matt sets an individualized curriculum for each student to ensure that they have the knowledge, and “musical tools” that will allow them to achieve and exceed their musical goals.